Discussion in 'Christian Advice' started by Tony Ramirez, Apr 16, 2019. Now I remember must have blocked it out. My cursing problem worsen in 2004 during my cousins wedding I broke a table was suicidal cousins friends made it worse by cursing while calming me down which I responded by hitting my head on the tree and wanted to run in traffic. Also made my dying Grandfather cry. Same year in the hospital commited again heard cursing made me meltdown when I got home. After that my Grandmother said I had to wear headphones outside. That's why I stopped attending Church. Did go to groups until 2006 but headphones ourside you know then left after. Was so bitter towards God that my hearing the f-word got worse that is when I abondon him and Christ because other Christians kept the faith with that going around. Really painful must have blocked it out but I guess losing the friends or future friends is my fault. I can't do any volunteer or outside or even attend church with f-words being said by everyone. Only now the Prozac making it bearable but only one meltdown but I never go out with headphones. I am afraid what might happen if I do. Thanks all anyway but really unless I go deaf "did actually ask God why I wanted to be deaf" I will have to make through life as it is an hermit lonely Church less Christian. I haven't been in a church where people talk that way. Were you maybe hearing things that weren't said? Anyway, why did you go there? My grandson goes to a mega church with loud music; he wears earphones when the music is loud. Sorry I did not mean in Church I meant outside of Church. I remember the time I had to take car service home and they were f-wording it like crazy this was after leaving Church of course I lost it when I got home. Same thing happened taking the bus at night threw an city trash can "they bolt them down now so it would not be possible anyway"
Just saying these instances made me an Atheist temporary, I then struggled to get back to God. It worked for a while but the Atheist thing won in the end causing me to leave the Church all over a horrible 4 letter word. Forgot to say but yes when I was with the friends I did have a couple of meltdowns. Nearly got in trouble with my friend neighbors after throwing a trash can. They found out when an older later came over using the f-word. I went into a meltdown actually crying after. They conformed me but knew my dark secret. I actually don't blame them for ended after the two main friends got married. Also many the times going to Friday night Church coming in rotten and not believing in God after hearing that word on the subway. They conformed me except that time when the service was closed and lost it when a kid going there did nothing and some lowlife was swearing to him for nothing. After that I remember throwing my bibles in the trash after which my "non Christian" Grandmother convinced me not too. Also other swears, s-word, both b-words irritate me. Heck I got through a movie where they said the s-word about 30 times, hated the movie it irrigated me but not to go into a meltdown. It is just the big f-word that not only irritates me but can make me hurt myself but listen please "never others" just myself. Okay Prozac helps a lot however is God against taking prescription drugs? I do feel ashamed as many other Christians don't need prescription drugs. Of course as you can see my cry for help story when I had those bad instances I was not on Prozac I was on bad medicine that the doctors though skito meds. So with Prozac I seen swearing yes I bothers me but I had only one meltdown at home. Again changing the subject I said outside the church. Why can't anyone understand simple questions? Thanks. As for snapping I am sorry I am just tired of people not understand what I am saying. My family, therapist does the same. I say something serious, they change the subject or say something like did you at this or that. As I said try living with this problem. What gets me is that is started when I was 16 years old after I had mononucleosis. I though when I got better "what if swearing bothered me" or "what if the f-word bothered me" well then after I though that it gradually got worse. Had my first meltdown in 1994 and after which it gotten worse. In 2000 when I went into the church my Grandmothers friend found I though I would finally get rid of it but it got rid of me as I originally posted. I'm sorry that I misunderstood you. Do you mean in the church parking lot or somewhere around town? Should the church close its doors to unbelievers? How would they do that? Sorry but generally outside you know on the street, stores, bus, subway. Or when I hung out to eat out not in the Church though. Again not in the Church. As I was going to say the reason why I left God was because if he could not fix my hearing the f-word problem and not hurting myself or breaking things the creator God then I knew no one else could which I why I left and I am been practically a hermit for the past 14 years. 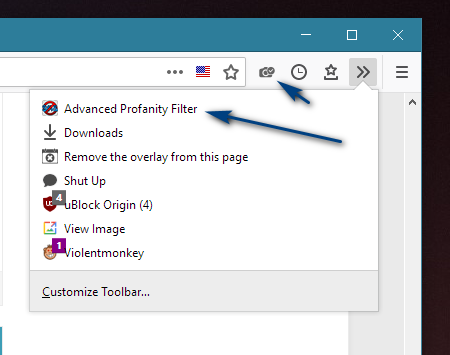 It is only the help of profanity filter extension and image blocker I use when I search that I am even able to get online. Also that I have not meet anyone on this entire planet where it bothers me like it does me hence the not understand by family, therapists and even Christians alike. Hey, at least you know how to block those things! As for our illnesses and failures, wouldn't we want to find a way to use those in a more positive way? Perhaps to care about others who have the same or similar struggles? So what is your ideal solution to this situation? What is it you would like God to do? If I knew that I would not be asking. I am just bitter that instead of it getting better it got worse and the fact that Christians are able to still hold on to there faith while I abandoned it. Too bad it only works on my computer and Android Phone using the Firefox browser and not in real life outside as I nearly abandoning going online back in 2010 before I found some working filters. Perhaps to care about others who have the same or similar struggles? Again not understand the question. I said I was the only one on this planet does my signature not say "1 out of 1.5 billion" counting only English speaking people and not counting the onces that say "I don't like hearing it but it does not bother me" I mean like psychotic breakdown bothers me people. Let me ask another way, what would you like to get better? Yes I hate my life and existence. I am just a burden on my family and I know they think it because the way they react. Too think I nearly died as a baby why didn't I? Why does God make me suffer though not only my Asperger which is manageable but this only problem which is not? I can’t see why God would be against medication when it is needed. Do you think someone who is diabetic ever questions if God would want them talking the insulin they need? God made man smart, gave man the ability to create medications to help. God isn’t making you suffer. Turn your suffering into why you draw close to God. I’ve dealt with massive social anxiety, depression so deep I tried to end it, I’ve got scars from self harm, lived with self hate and loathing for most of me life. Never saw a way out. But there is. It’s God. Through Him we can get through it all. Somewhere in a post you said something about being bitter. Pray to Him that He shows you how to defeat it. To love instead. It’s possible. I know. I use to be bitter, angry, mad, depressed, crazed, everything no one wants to be. Prayer. Talk to your Father. It doesn’t have to be formal or fancy. Just talk to Him. Read scripture. Even if you find a verse or two a day to read over and over. Let His Words sink in. Let His love sink in. Pray for the Spirit to guide your days. Start each day with the Lord in prayer. Talk to Him all day. End your day the same. Don’t give up. He is there. A prayer away. What about fear petrified fear that I have? Pray for that fear to be removed. Keep praying. Here on some scriptures on fear. Thanks. At least I can talk here as I have no console at home everyone living home all aunts uncles cousins all unsaved or no friends to turn too. I understand. My husband, my children, my family, none are Christians. Some are strong atheists. A church home would do so much for you. If you find some that interest you, could you email the church and talk with the Pastor to see how they can help. Maybe they have small home groups that would be good.